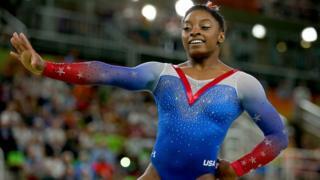 She has flipped, tumbled and leapt her way into the hearts of millions over the course of the Olympic games. But when Simone Biles returns home she will be in for not just a major celebration but also a hefty tax bill. The 19-year-old has won five Olympic medals - four gold and one bronze. She has cemented her title as the world's best gymnast by taking home the gold in the all-around after three successive world championship titles - a feat only accomplished by three others in history. That estimate is based on the $2m that she has accumulated in endorsement deals and assuming she is charged in the highest income tax bracket in the US - 39.6%. Biles is not alone, her fellow US medallists will be slapped with tax bills for their victories as well. American Olympians are subject to a so-called "victory tax" - a tax on both the money they receive from the Olympic committee for winning and on the value of the Olympic medal. What are they taxed on? US athletes who win a medal at the Rio games will take home the hardware and a cash bonus from the US Olympic Committee. Gold medallists will receive $25,000, silver medallists get $15,000, and bronze winners earn $10,000. Those winnings are taxed as income, the same way Americans are taxed on other prize money, like lottery winnings. Most countries exempt their athletes from these taxes. But there's more, the medals are also given a value and taxed. The value is based on the value of the materials the medals are made of. Gold medals - which are mostly made of silver with a gold plating - are worth roughly $600 based on current commodity prices, silver medals are worth close to $300, bronze medals - which consist mostly of copper - have barely any monetary value, approximately $4. Assuming the athlete was already a high-income earner, paying the top bracket of US taxes, they would be paying 39.6% on the combined value of the medal and cash payout. Americans for Tax Reform calculated the bills to be: for a gold medallist $9,900, for silver $5,940, and for bronze $3,960. That's also assuming the athlete only won one medal. For US athletes like Michael Phelps and Simone Biles, who have multiple victories, including multiple gold medals that bill could be much higher. Some analysts believe Phelps, who's worth an estimated $55m, could face a tax bill of $55,000. It's worth noting athletes in a lower tax bracket would have to pay less and most athletes can deduct the cost of training from their tax bill. For years politicians, athletes and fans have debated whether the tax is reasonable. Why should an athlete who worked so hard to represent and win for their country be charged for their victory? "This tax places a hardship on our athletes and unfairly taxes them for representing our country and reaching the pinnacle of their sport," said Jim Leahy, the executive director of the US Olympic luge committee. In July, a bill to stop taxation on Olympians and Paralympians, sponsored by Republican Senator John Thune and Democratic Senator Chuck Schumer, passed a vote by the Senate. A similar bill has been proposed in the House of Representatives, but it has not come up for a vote. "After a successful and hard-fought victory, it's just not right for the US to welcome these athletes home with a tax on that victory," Senator Schumer said. He noted that most countries subsidise the cost of training for the Olympics and don't charge their athletes for winning. Most US athletes must pay for their own training and few can sustain a professional living on their athletic winnings alone. The US Olympic committee pays for health insurance and stipends for only a small number of US athletes. This is not the first attempt at changing the taxation rules around Olympic victories. In 2012, Florida Senator Marco Rubio introduced a bill to prevent Olympic athletes from being subject to taxes on their winnings at the London games. "We can all agree that these Olympians who dedicate their lives to athletic excellence should not be punished when they achieve it," said Senator Rubio at the time.